You can make a difference in the lives of Coloradans living with life-threatening illnesses by joining our volunteer team! 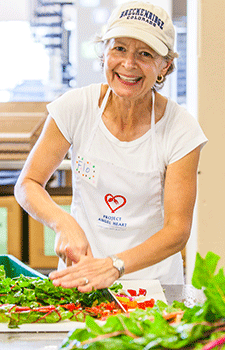 Volunteers make it possible for Project Angel Heart to prepare and deliver thousands of meals each week. There are many ways to become involved in our work. You can help in one or more of the following areas. Click the link that best describes your interest for more information and to access our online sign-up system. We do require that all new volunteers attend an orientation at our office in Denver or Colorado Springs. Sign up for an orientation here. For more information about volunteer policies and procedures, please review our volunteer handbook. If you have any additional questions, please contact our Volunteer Resources team at volunteer@projectangelheart.org or 303.830.0202.